Pelicans are intersting birds to say the least. So darn big. Yes, they seem incongruous on fresh water. For some reason, we associate them with salt water. Go figure! Hi Eliza, I am not sure how we formed the tight association of Pelicans with salt water only but I think I will blame it on cartoons I must have seen as a child. There’s no telling where some birds settle, even with mans best efforts to make their life harder. We have a rookery of Night Herons, same location every year. The old battery (civil war) on the tip of Charleston peninsula. The number one tourist stop, the number one tourist town in the US. Some birds get revenge on the tourist below. Enjoyed this handsome pelican photo, Mike. Such a little rock for a big bird. HI Jet, This was a very nice looking Pelican and except for the shore that rock was the only available perch. I remember seeing a flock flying overhead and my mate who is native to Colorado saying they were pelicans. I ridiculed him. And then found out that pelicans do, in fact, hang out in Colorado. Thank you for this glorious photo! HI Tracy, it is always a harbinger that spring really has sprung when the Pelicans returned to Denver. It is always a joy to see them circling way up high in the air looking for those small lakes that they make home in the summer. He’s gorgeous. I only see brown pelicans here in Florida. Hi and thanks for the feedback. The opposite is true here we only have the white Pelicans. Sure, do they like the cold? I’ll have to ask them next time I see them, but the answer is probably not. Unfortunately the ponds up here are not heated. Best to camel for the gators sake. 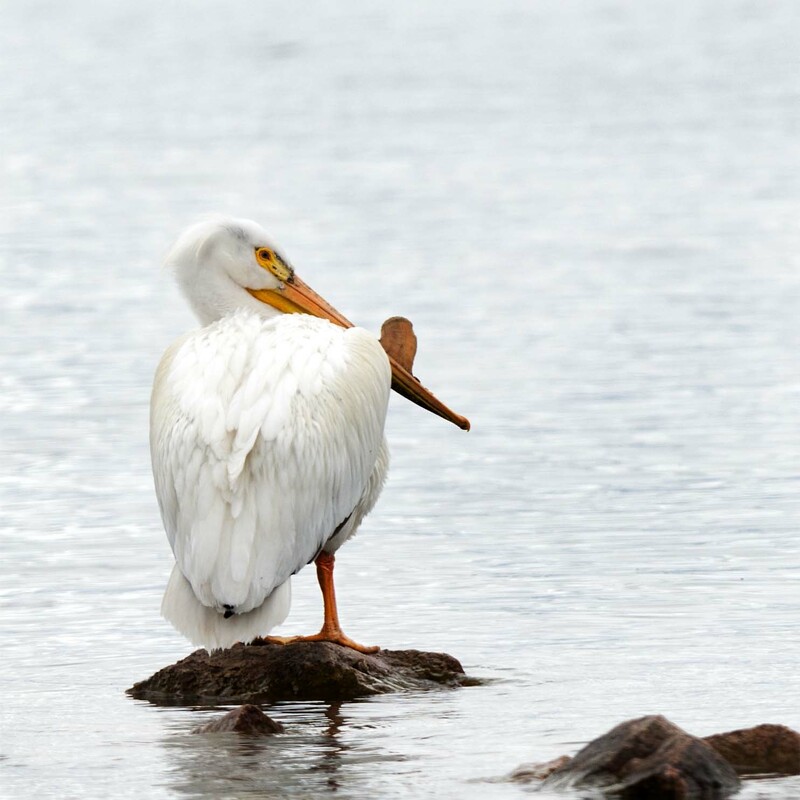 When we saw our first White Pelicans on a reservoir in Colorado many years ago, we did not trust our eyes. And even though we have since learned to expect them in our state, each sighting is an unexpected surprised. Hi Tanja, yes even after years and years of seeing pelicans in the rockies it is always just a little surprise that makes you think twice. Hope your spring is treating you well. It is, thank you. I hope you are enjoying your spring, too, Mike! So far it is going well. A bit overcast but nice.